In his bestselling book Law of Attraction, Michael Losier showed us how we can attract the things we want through our attention, energy, and focus. But what if you aren't able to pinpoint what you want in life? What if you're stuck, unsatisfied but unable to see what's holding you back--unable to identify what will truly bring you joy? 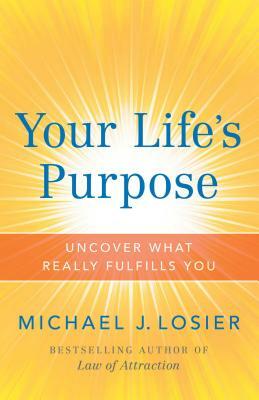 In Your Life's Purpose, Michael Losier dives into our most basic motivations and lays out a simple guide to help you identify your strongest needs. These needs, which he calls Fulfillment Needs, are the 4 core motivators that, when taken together, describe the meaning and purpose of your life. Michael Losier's books, courses, and videos have helped millions of people around the globe to improve their relationships, redirect their energies, and find personal fulfillment. You may be surprised how easily you can find your life's purpose. Michael Losier is the author of the best-selling books Law of Attraction: The Science of Attracting More of What You Want and Less of What You Don't, and Law of Connection: The Science of Using NLP to Create Ideal Personal and Professional Relationships. After delivering over 900 hours of teleclasses and hundreds of one-on-one coaching sessions, Michael combined his teaching experience with his knowledge of NLP (Neuro-Linguistic Programming) into his first book, Law of Attraction. Having just celebrated its 12th anniversary, it has sold over 1.9 million copies and been published in 34 languages. The follow-up, Law of Connection, was published in 2009 and quickly became another best-seller. He has been interviewed four times on Oprah Winfrey's Soul Series radio show, and enjoyed a year-long run hosting his own show on Oprah & Friends radio. Michael Losier travels the world, delivering hundreds of hours of teleclasses, podcasts, workshops, and seminars every year. His YouTube videos have millions of viewers, and his live weekly Internet show, Hang Out with Michael, allows him to connect with fans in an exciting new way.